Advantages: waterproof; flexible latex pad; electrostatic precipitation; can be used for wet or dry application; better surface coverage; good disposal of waste; very aggressive; longer product life; removes paint. Available in range of grain: P80, P100, P120, P150, P180, P220, P240, P280, P320, P360, P400, P500, P600, P800, P1000, P1200, P1500. Used for wet and dry applications. 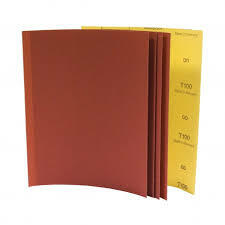 Norton T100 Sandpaper offers excellent material removal combined with exceptional uniformity. The flexible latex lining makes this product extremely adaptable to curves and contours. This is a perfect solution for the car and wood markets.